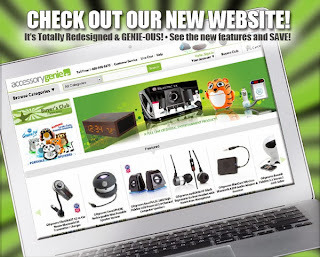 Accessory Genie - Consumer Electronics and Accessories Industry News: Totally Redesigned. It’s Genie-ous! We have some BIG NEWS!!! Here at Accessory Genie we are pleased to announce the launch of our new and improved website! We have revamped the whole site using our signature “Genie-Green” colors, making it just as easy on the eyes as it is to browse for your favorite items. With our improved search functions, our new site is designed to make hunting for your favorite Accessory Genie products fun and simple. We have also enhanced customer checkout which securely saves customer billing and credit card information to make future purchase quick and easy. Shop with confidence with our “Good as Gold” guarantee which provides 45 day returns, accurate charges, on-time shipping, fraud protection and live phone and email support. One of the biggest features is the new Buyers Club. This is a free program that guarantees the lowest everyday price on every product. Simply sign up with you email and you are a Buyers Club Member! Even better- you get first access to weekly specials, exclusive promotions, and more!! What’s the catch? There is no catch. The Buyers Club allows us to offer the absolute lowest everyday pricing on a variety of our products. As always, we offer everyday low shipping for only $3.99 anywhere in the continental U.S., excellent live customer service support, and safe and secure checkout. We hope you enjoy& Happy Shopping! Don’t forget to subscribe to us on Youtube and follow us on Twitter for even more great deals!